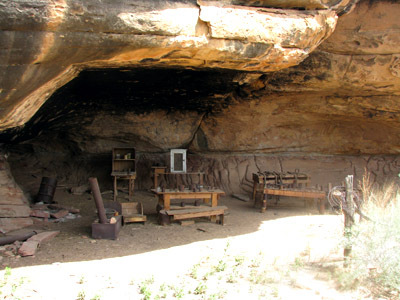 Every time we come to Canyonlands and Arches National Parks (this is our third visit) there are new rules concerning dispersed camping. 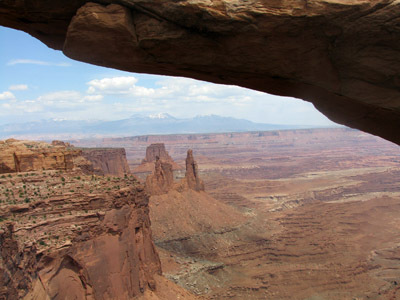 We can see why: the entire Moab area has just become too popular. And not just the parks. Thousands of Jeep and mountain-bike enthusiasts come to experience the stellar scenery with the added novelty of challenging slick-rock trails dedicated to their sport. Picture Moab on a springtime Friday night: all the campgrounds, hotels, restaurants, and bars buzzing with a new crop of weekend thrill-seekers. While it was fun to witness, we made a quick mental note to ourselves: "remember to avoid weekends". It was, however, sort of fitting that the whole town of Moab was in a celebratory mood. This was, after all, our last hurrah - the final stop on our four-and-a-half-month trip. 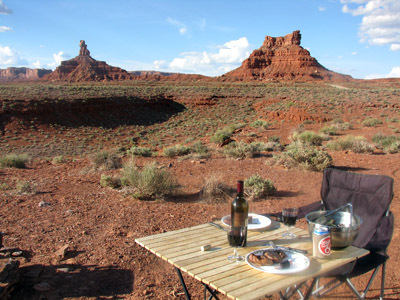 Prior to arriving in Moab, we took several "days off". 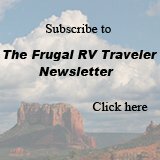 Our style of travel is seldom "relaxing" - we're camping in a new location almost daily and hiking at every opportunity. 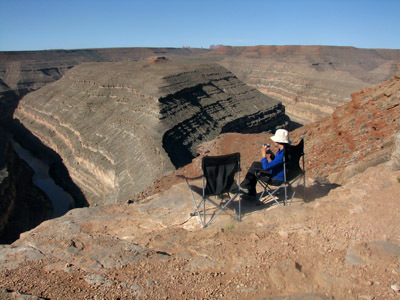 For us, time off meant just being in a scenic location and "sitting" (no driving or hiking) for a few days. 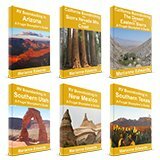 We stocked up on supplies and chose two scenic areas almost adjacent to each other: Valley of the Gods and Goosenecks State Park. 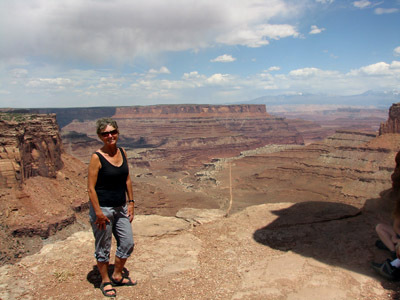 When we were nicely revived, and with a renewed appetite for hiking, we visited Canyonlands National Park. 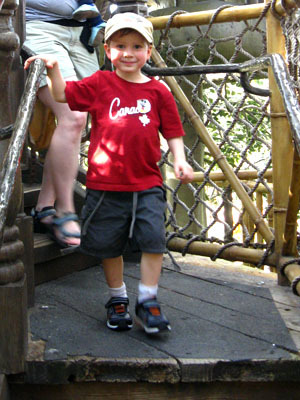 In The Needles section of the park, we hiked to Chessler Park - a six-mile return hike. The entire trail is an amazing 11-mile loop but we didn't have that in us. It was a hot day and we know our limits. This shortened version was strenuous enough and very rewarding with lots of variety of scenery on route. 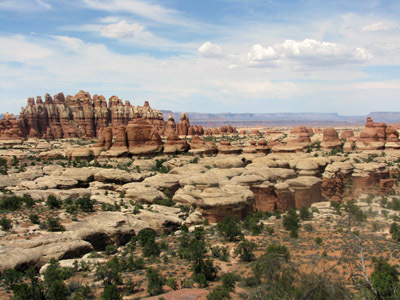 We hiked the park's shorter trails too, then moved up to Moab where we spent our final three days (yes, unfortunately, over the weekend) in the Island in the Sky district of Canyonlands and Arches National Parks. 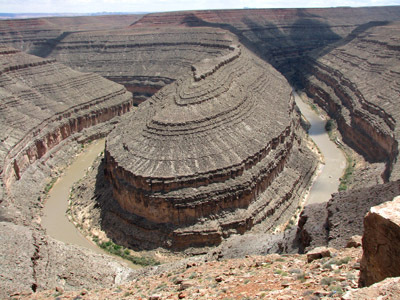 Arch formations do form in many southwest locations but they are still rare. In this particular seventeen-mile long area, the sandstone layers were formed uniquely millions of years ago, when seas covered and receded 29 times, leaving behind enormous salt deposits. 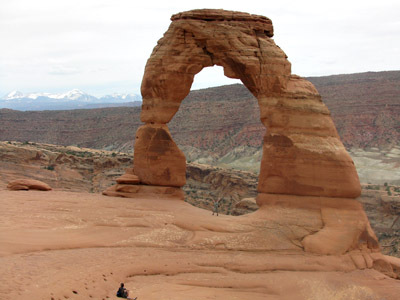 Uplifts, cracking, and weathering (on going) creates the arch formations. 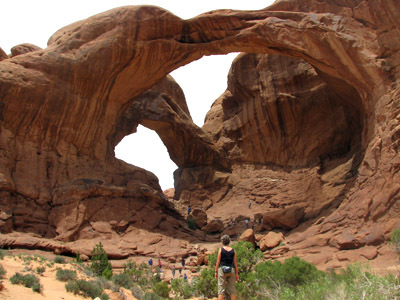 There are more than 2000 natural arches in Arches National Park. 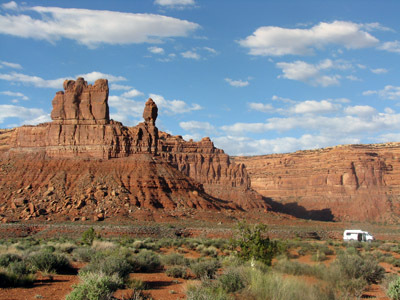 From Moab, we now begin our drive home to Ontario - we're not real fond of this part but, with a couple of stops in the driveways of Boondockers Welcome members, the long driving days should be spiced up a bit. Sad to end another trip and happy to have missed the "winter that refused to end" (as my daughter put it), but we realize life at home did go on without us. 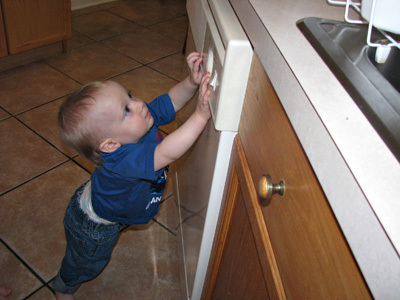 We missed important events, not the least of which was our grandson Daniel's first steps. One year old at the end of February, he held out taking those steps for as long as he could - I was CERTAIN he was waiting for us to be back. But two weeks ago he gave up on waiting. That's when we knew it was time to go home. When these two little boys come running into our arms, our trip will have its perfect end. How did you do that many days for that price?